The Casa de Mateus was built in the first half of the 18th century by António José Botelho Mourão, 3rd Morgado de Mateus. This replaced the former family house which had stood on the site since the beginning of the 17th century. In 1910, it was classified as a National Monument. 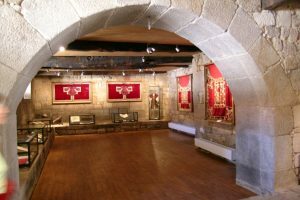 The artefacts on permanent display at the Casa de Mateus constitute an important and unique collection of heritage and artistic value that communicates the history of the Family and the House. The Casa de Mateus is nowadays a living museum which retains the original arrangements and functions of many of its rooms. 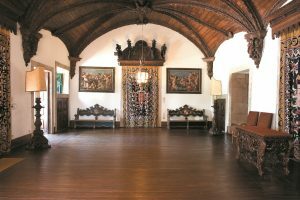 A tour of the Grand Floor of the House enables the visitor to view the original rooms and contents of the House as well as the Museum’s exhibition rooms, first installed by D. Francisco de Sousa Botelho de Albuquerque. On the ground floor there are dedicated exhibition areas in the former domestic quarters, since renovated by the Fundação. The Chapel, Winery and Gardens are included in the tour. The Salão de Entrada, in the manner of heraldic halls typical of noble houses of the 17th and 18th centuries, displays on its chestnut ceiling the arms of the builder of the House, António José Botelho Mourão (Botelho; Mourão; de Vasconcelos; Aguiar – the same as are to be found on the pediment in the centre of the House’s façade). It was D. Francisco de Albuquerque who, working from an original drape embellished with the arms of the Sousas, commissioned the other three coats of arms of the Botelhos, Melos and Albuquerques, as well as the banquettes that line the walls of Salão, designed by Paulo Bensliman. In the North Wing, adjoining the Salão de Entrada, the Library houses, in addition to a remarkable collection of early books, the documents, proofs, plates and other items relating to the celebrated 1817 edition of Os Lusíadas by the Morgado de Mateus, D. José Maria. The edition was printed at the Firmin Didot works in Paris. Gérard co-ordinated the commissioning and execution of twelve engravings, ten of them alluding to each of the poem’s cantos and a further two depicting Luís de Camões and D. José Maria, drawn by Evariste Fragonard and Alexandre Desenne, engraved on copper plates by Raphaël-Urbain Massard (le Jeune). 210 copies were printed on paper, which the Morgado presented to important European figures, public libraries and scientific and cultural institutions around the world. For his own use, D. José Maria commissioned the printing of a single copy on parchment, which he entailed in his will, along with the copper plates, to the Morgado de Mateus. At the west end of same wing, the 3rd Count of Vila Real created four bedrooms in the former ‘Salas de Mateus d’Allém’ reached by a corridor from the Library. Later, his grandson, D. Francisco, remodelled this wing to make it more comfortable and convenient. The final bedroom off this corridor retains its original ceiling. Among the furniture in these bedrooms is a bed from the period of D. José I with a moulded and carved bedhead crowned by a plume of feathers. In the style that gained wide acceptance at the time of D. Maria I, the first bedroom contains a bed in the neoclassical taste, with austere lines and the sobriety of decoration that replaced the curvees and carved decoration of earlier artistic movements. These rooms still retain their original fitted wardrobes in situ, among them one in lignum vitae with a front decorated with barley-twist mouldings. The choice of paintings decorating the bedrooms follows the fashion of the time for pictures with religious themes. The Sala do Tijolo, to the south of the Salão de Entrada, is dominated by portraits of D. João V and D. Maria Ana de Áustria and an allegorical series of the four seasons painted by an artist of the Archimboldesque school of the 17th century. The 4th Morgado, D. Luís António de Sousa Botelho Mourão, who listed these paintings in a document of 1786 as belonging to the effects of the Casa dos Moroleiros, left us some descriptions of the original decoration of the rooms in the Casa de Mateus. His description of the Sala dos Tijolos records a richly furnished, comfortable room decorated with a set of hangings depicting Biblical scenes of David, Nabuchodonosor and Paradise, and with yellow and gold damask drapes with silk fringes framing the five doorways. The room also contained a sideboard covered by a cloth in the same material. Currently, the room houses a matching set of cabinets made from Brazilian mahogany, Indian rosewood and lignum vitae, showing the features of the so-called “Portuguese style” characterised by barly-twist decoration and bulbous turning with exaggerated narrowings. In the larger cabinets, D. Luís António carefully guarded part of the documentary records of the Casa, a task continued by his son. In the centre of the room, on an Indian rosewood tripod table turned by a master cabinetmaker, stands a splendid Hispano-Arab faience plate decorated with copper highlights, produced at the Manises potteries. In the Sala da Loiça Azul, a former office, the visitor can see portraits of the Family executed in oils, engravings, watercolours and contemporary photographs. This wealth of portraits, assembled since the 17th century, is a unique symbolic expression of the identity, unity and continuity that power and prestige conferred on the Family. The small group of furniture in this room comprises a late 19th century table piano, a Japanese lacquered cabinet with golf relief decoration and drawer interiors in makié which can be dated to the first quarter of the same century, and a Portuguese-made dresser in which is displayed part of a vast dinner service in Chinese porcelain with so-called “Canton” decoration. The quality and number of imported porcelain pieces that can still be seen at Mateus testify to the variety and elegance of the table etiquette practised at the Casa, particularly from the 18th century onwards, through the acquisition of a wide range of decorative pieces and huge items of commissioned Chinese porcelain tableware, also known as East India Company porcelain. 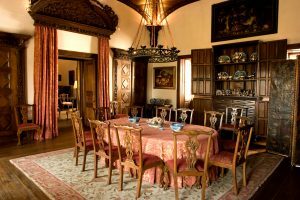 In the Dining Room, which is still used on special occasions, there is an imposing cabinet in solid Brazilian mahogany and lignum vitae with barley-twist decoration on its doors and the fronts of its drawers. It has a lower range of six drawers simulating fourteen, and the upper body has two half doors and three shelves which are currently used to display a number of pieces of 18th and 19th century silver plate. The Rococo silverware includes an English teapot heavily decorated with motifs of shells, pagodas and scrolls. In the later neoclassical style, there is a beautiful late 18th century basin and jug set decorated with fluted chasing. Under the Counts of Vila Real the tableware at Mateus was extended with a new, specially commissioned Chinese porcelain dinner service decorated with gold, a vast glass service and an elegant tea service and cutlery canteen in monogrammed silver. In keeping with the function of this room, the theme of still life is well represented in various paintings from the Amberes school of artists, in particular Jan Fyt, Frans and Peter Sneyders. 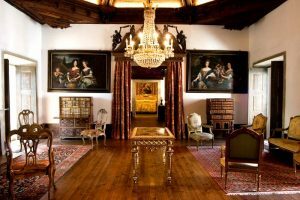 The Receiving Room, also known as the Sala Rica, contains an exceptional group of imported furniture from different cultures. Complemented by the decorative and allegorical nature of the paintings from the school of Pierre Mignard, the variety of furniture displayed here lend this room an air of refinement and exuberance. The teak panel from Gujarate in north India decorated with tortoiseshell and mother-of-pearl inlays, which now forms part of a 19th century table, is one of most important pieces in the House’s contents. There are abundant references to cabinets, chests, games boards, writing desks and table tops decorated with mother-of-pearl and tortoiseshell inlay being imported into Portugal from this and other parts of the Mogul Empire to add to the furnishings of noble houses. Another example of the aesthetic miscegenation between East and West, resulting from the Portuguese presence in India, is the Indo-Portuguese cabinet on display in this room. The ebony and ivory decoration inlaid on the teak structure forms a dense and highly detailed plant pattern featuring the usual representations of tigers. Standing on a tripod table, it has a range of two drawers and an open lower body resting on four arches. The feet represent four nagini, Hindu deities who are the guardians of underwater treasure. Similar in construction and function is the Bargueño (bureau) on the opposite side of the room, standing on a low cabinet with doors and drawers. The flush lid, the compartmentalisation of the interior into a series of small drawers and doors with bone frontals and columns, the rich polychrome effect highlighted with gold and the complex metal fittings are some of the particularities commonly seen in this, one of the most distinctive pieces of Spanish furniture. English furniture is represented by an important matching cabinet and tall clock in oak with a floral inlay in five different shades of exotic woods. Popular in Holland around 1675, the fashion for floral inlay compositions was soon adopted in English furniture of the William and Mary period. The tall clock at Mateus was made by the master clockmaker Joseph Windmills in 1702. The Sala Rica also contains a Portuguese oratory cabinet decorated with red lacquer and gilt motifs reminiscent of the metal fittings of “bronzed” cabinets. The Museum Rooms, installed here by D. Francisco, 3rd Count of Mangualde and recently refurbished by the Fundação as part of the new museum programme, contain an important collection of works of religious art bearing witness to the piety of members of the family who, especially in the 17th and 18th centuries, enriched the liturgical and Mass furnishings of the Capela de Nossa Senhora dos Prazeres through the acquisition of silver altar plate, vestments and devotional images. the acquisition of a very important collection of reliquaries donated by Diogo Álvares Mourão, the Saintly Archdeacon, who brought numerous fragments of the bones of martyrs and other saints from Rome. Prominent among this huge set of receptacles for the custody and veneration of holy relics is a series of silver reliquaries in the form of monstrances, made by a Rome goldsmith. The sculpture room testifies to the profoundly held religious convictions of the personages in the history of the Casa de Mateus. In keeping with the spirituality of the Baroque period, with its strong Marian devotion, the most important pieces displayed today in the Museum are an appealing testimony to the quantity and variety of the sculptures which the Casa dedicated to the Virgin Mary. Among the more noteworthy pieces are the images of Nossa Senhora da Conceição in ivory, from an Indo-Portuguese workshop, and those of St. Anne teaching the Virgin Mary to read, which was one of the favourite devotions of D. Luís António de Sousa Botelho Mourão, the 4th Morgado de Mateus. The Museum also houses a magnificent dying Christ of Ceylonese-Portuguese origin, and a 16th century German bas relief in Solhnofen marble depicting the Descent from the Cross, one of the most notable pieces in the collections of the Casa de Mateus. The second room houses the more important liturgical vestments and plate given by succeeding generations for service in the Chapel which, on the more solemn days of the Church calendar, was the scene of great theatrical and emotional intensity. In 1759, the Gazetta de Lisboa reported the celebration of a solemnly sung Te Deum Laudamus with music in an action of grace for the recovery of D. José, presided over by Luís Botelho Mourão, Canon of Braga, with the assistance of the Archdeacons of Covilhã and Labruje, the community of São Francisco and the clergy of the surrounding parishes. The construction of the new chapel in 1759 also required the renewal of the liturgical vestments and plate used in the celebration of the Mass. Contemporary with the consecration of the new chapel, we can still see a pontifical vestment, a set of canons and a monstrance made in Rome. Also among the more notable items is the set of three scapulars of the Order of the Barefoot Carmelites which accompanied D. Luís António during his tour of duty in Brazil, clear testimony to the private devotion of the 4th Morgado de Mateus to Nossa Senhora do Carmo which led him to baptise two of his children, D. Maria do Carmo and D. José Maria do Carmo, the Morgado dos Lusíadas, with this dedication. In addition to the rooms displaying the permanent major collections of the Casa, in 2004 the Fundação renovated the areas on the ground floor known as the ‘Casa das Batatas’ and the ‘Frasqueira’ to house an exhibition of objects associated with D. Luís António de Sousa Botelho Mourão. This displays a categorised range of artefacts associated with his life, particularly with his military career. D. Luís’s fame at Court was due to his prompt action during the Spanish invasion of Portugal in 1762. As Lieutenant-Colonel of the Chaves Cavalry, he anticipated a surprise attack on the frontier and managed to repel a huge and well-armed Spanish regiment. This feat of arms led, in the course of Pombaline politics, to the choice of D. Luís to restore, mainly by force of arms, the Captaincy of S. Paulo, which had become extinct. In 1764 he was appointed Governor and Captain-General of the Captaincy of São Paulo in Brazil, which he governed from 1765 to 1775. In the military field, he was an exemplary trainer of regiments, built the fortress at Iguatemí on the frontier with Paraguay, and conquered a vast unknown territory in the state of Paraná. The campaign for the restoration of the Captaincy of São Paulo, based on military organisation, territorial exploration, urban development and economic revival, found an effective leader in the 4th Morgado de Mateus. Of a more intimate nature are some letters in the exhibition exchanged with his wife, D. Leonor Ana Luísa Josefa de Portugal, who administered the Casa de Mateus during D. Luís António’s absence. Among the items on exhibition in this room is some of the finery worn by the 4th Morgado for horseriding or at Court functions. These include two saddlecloths with appliqué embroidery depicting the arms of the Botelhos in the centre, and a blue velvet saddlecloth bearing the arms of Sousas do Prado and Botelhos embroidered in fill stitch. These items were designed to cover horses which, on certain public display occasions, were led by the reins, unsaddled, with the heraldic devices on them identifying their owners. These caparisons suggest a link to the Stables next door to this exhibition room, in the central perspective axis of the House, beneath the Salão de Entrada. On the 19th century litter, also displayed here, one can see the arms of the Melos, whose lineage is today represented by the present President of the Foundation, D. Fernando de Sousa Botelho de Albuquerque, Conde de Mangualde, Vila Real e Melo. 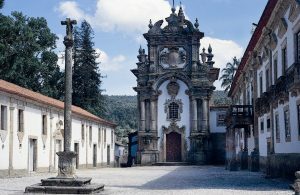 The construction of the Chapel was begun by the builder of the House, António José Botelho Mourão, and completed after his death and inaugurated by his son, D. Luís António, in 1759. It replaced the old chapel of 1641, the ceiling and high altar of which were incorporated into the new sacristy. 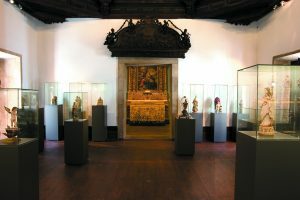 In keeping with a desire for monumentality and greater solemnity in the practice of religion at the Casa de Mateus, the existence of a vast collection of reliquaries left here in honour of Nossa Senhora dos Prazeres in the will of Diogo Álvares Mourão the Saintly Archdeacon, brother of the Morgado da Prata and uncle of the builder of the House, prompted the erection of a new chapel. From Rome, where he was intimate with distinguished figures in the Roman Curia during the pontificate of Clemente XI, among them Cardinal Sacripanti, the Saintly Archdeacon brought numerous reliquaries which are today in the Museum, together with the body of St. Mark the Martyr which is displayed in the Chapel. Among the Morgados de Mateus buried here are D. Luís António, D. José Maria, the 3rd Count of Vila Real, D. José Luís, and D. Francisco, 6th Count of Vila Real, 5th Count de Melo and 3rd Count of Mangualde.